County Attorney: Washington County, Minnesota (Senior Assistant County Attorney); 1975 to 19?? He was raised on a dairy farm. His father died when he was nine months old. He died from complications due to chronic myelogenous leukemia at United Hospital in St. Paul, Minnesota. His funeral was held at Hosanna Luthern Church in Forest Lake, Minnesota. He was a member of Messiah Lutheran Church-Missouri Synod in Forest Lake, Minnesota. Religion provided by his obituary and a newspaper article. Session Notes: He was appointed by Governor Arne Carlson to a District Judge position in December 1997. His resignation from the Minnesota Legislature was effective on January 15, 1998. Harlow, Tim. "Six-Term Legislator Turned Judge Fought Drunken Driving." Minneapolis Star Tribune, February 7, 2009, p. 6B. Chin, Richard. 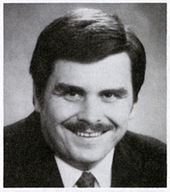 "Forest Lake Lawmaker Later Served as Judge (Obituary)." St. Paul Pioneer Press, February 5, 2009, p. 10B. Healy, Nick. "New Judge Leaves Behind Family Ties in Legislature." Session Weekly, St. Paul: Minnesota House of Representatives Information Office, January 23, 1998, p. 14.